Now Free Shipping on all Product orders over £25! - Not applicable to surcharge areas! 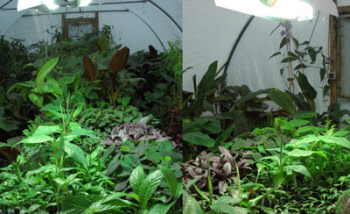 Supplementary lighting for tropical plants in our dark winters can be quite important for healthy growth. Our range of lighting systems cater for greenhouse bench propagation and seed raising as well as additional more powerful lighting for conservatories or greenhouse tropical displays. We normally only offer the blue (daylight) broad spectrum light bulbs that are evenly balanced between the blue to red spectrum which we find perfect for growing our tropical plants under. 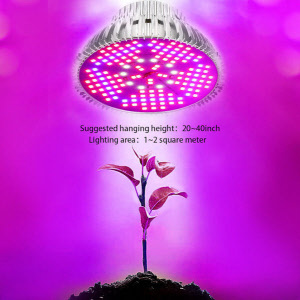 LED lights are becoming more cost effective now and this multi light LED spot lamp has both red and blue lights configured to enhance the plants absorption frequencies. 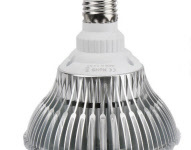 It is approximately 60 watt (58 x1w leds) and equivalent to a 75 watt CFL bulb with 1500 lumens output and equivalent light output to a 150 watt tungsten bulb but without the heat. In addition they have an expected life of 50,000 hours compared to 10,000 hours for CFL and 1000 hours of a tungsten bulb. It has a standard ES 27 screw fitting and we supply the bulb with a 1.8m cable with plug and socket. The switched lamp socket can be hung by the clip assembly or simply clipped on to a suitable shelf or hanging support. I would suggest that the lamp be mounted no more than 2ft above the plants and it will then cover an effective area of about 1/2 a square metre or 4ft to cover a circle of about a metre but of course a bit less light strength. The lamp is in an attractive spotlight form and does not require any shade or reflector. 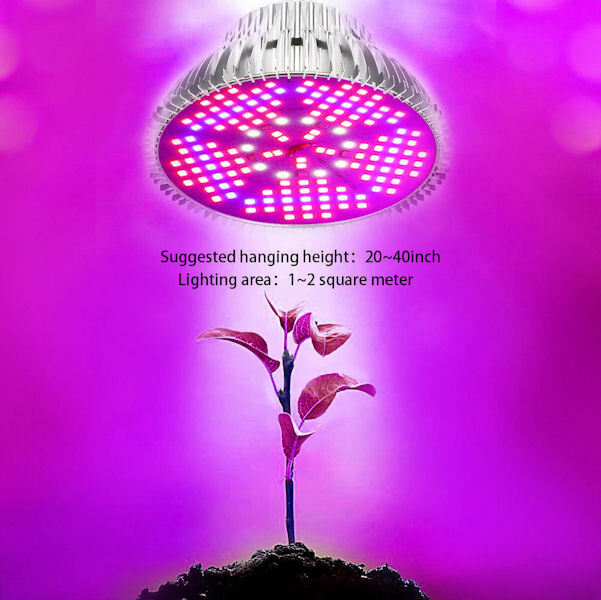 The output colour is quite amazing but covers the full light spectrum needed by your plants for both growth and flowering stages. 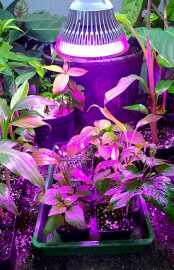 LED lights are becoming more cost effective now and this multi light LED spot lamp has both red and blue lights configured to enhance the plants absorption frequencies. 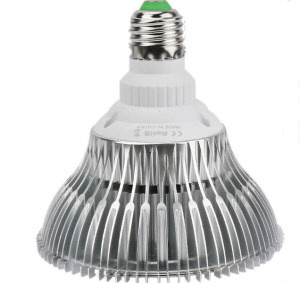 This 80 watt top end bulb utilising 114 LEDs is equivalent to a 100 watt CFL bulb with approximately 4000 lumens output and equivalent light output to a 200 watt tungsten bulb but without the heat. In addition they have an expected life of 50,000 hours compared to 10,000 hours for CFL and 1000 hours of a tungsten bulb. It has a standard ES 27 screw fitting and we supply the bulb with a 1.8m cable with plug and socket. The switched lamp socket can be hung by the clip assembly or simply clipped on to a suitable shelf or hanging support. LED lights are becoming more cost effective now and this multi light LED spot lamp has red and blue plus white and IR leds configured to enhance the plants absorption frequencies. 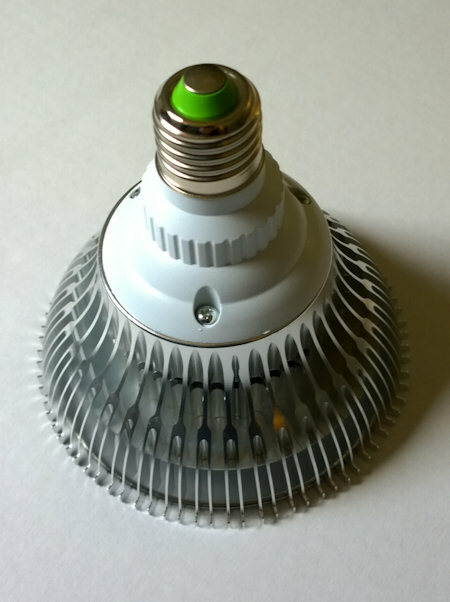 This 100 watt top end bulb utilising 150 LEDs is equivalent to a 120 watt CFL bulb with approximately 5000 lumens output and equivalent light output to a 250 watt tungsten bulb but without the heat. In addition they have an expected life of 50,000 hours compared to 10,000 hours for CFL and 1000 hours of a tungsten bulb. It has a standard ES 27 screw fitting and we supply the bulb with a 1.8m cable with plug and socket. 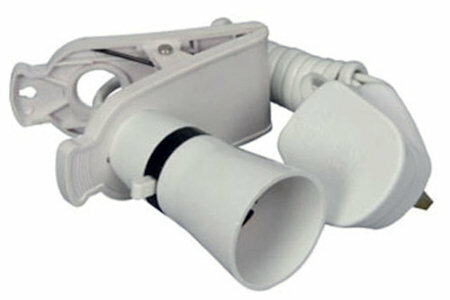 The switched lamp socket can be hung by the clip assembly or simply clipped on to a suitable shelf or hanging support.